My dad’s funeral was on a Monday in 1996, in Winnipeg. It was a graveside service on an overcast fall day. I didn’t shed many tears at the funeral. I think that I had already said my goodbyes long before his burial. Still, as I saw my dad’s casket being lowered into the ground, tears trickled down my cheeks. In Judaism, the casket is minimalist and is made of cedar. No rich or poor in burial; we are all equals at death. Some old bibles were thrown into the excavation – this is considered to be a blessing for the deceased. As the coffin was lowered, my mom, brother and I recited the Hebrew mourners’ prayer. It is this prayer that is to be repeated during the first full year after a loved one’s death. It is a way of honouring the dead and helping the deceased soul evolve. The prayer praises God even during times of sorrow. One by one, we took one or two shovelfuls of soil to cover the coffin. The Rabbi in attendance explained that this is akin to covering a child with a blanket while putting a child to bed. I liked that image. My brother Joel did a moving eulogy starting with the words, “Today I wear my father’s coat.” He spoke about how my father taught him how to love. We ended the graveside service untraditionally as Joel led us to sing one of Dad’s favourite wartime songs popularized by Vera Lynn. We had listened to that song many times during the seven months prior to my dad’s death. Although written to comfort soldiers and their families during World War II, for us the lyrics took on spiritual meaning. For us it was a declaration of sorts that there is an afterlife and that death is not really the end. While walking back to the limousine, I overheard my friend Joan ask the Rabbi if he had noticed the seagulls circling about. “That is the soul,” he responded. Ever since my dad died there seemed to be a theme evident in the form of birds sending messages. After the funeral, we silently rode back to my parents’ house to begin the Shiva. A bowl of water along with a towel was waiting for us just outside the door. This ritual marked leaving the cemetery behind and moving on in life. As Jewish tradition dictates, mirrors had already been covered with sheets to remind us that we should not be concerned with vanity as we mourn. I entered the house feeling relief that the funeral was over. I gathered with my friends in the den. It was this very room that had housed my dad’s hospital bed for most of his last month of life. I sat on the couch flanked by my closest friends. I was surprisingly calm. My friend Evy, on the other hand, was crying continuously. An older, bald-headed man with a short stature entered the room to give his condolences. I wasn’t sure who he was – I believe that he might have been the father of one of my brother’s friends. The man headed in my direction but instead of taking MY hand, he sandwiched Evy’s hand between his, shook it briskly, and said how sorry he was about her loss. To this she replied, while pointing at me – “No, it was her father who died.” It was such a hilarious moment and provided much needed comic relief. But there was still more to follow. My nephew Simon, who at the time was about four, somehow locked himself in my parents’ bathroom. He tried to turn the locking mechanism, to no avail. He began to cry. His father– my brother Joel–went outside to talk him down through the bathroom window. The window unfortunately was beyond my brother’s height, requiring Joel to jump up and down as he tried to comfort his hysterical son. Meanwhile, my husband and some friends endeavored to unlock the door from the outside to no avail. Then they tried to take the door off its hinges – no luck. Simon was becoming increasingly panicky. We didn’t want to burden my mom with our problem. Luckily my husband was ultimately able to remove the locking mechanism from the outside. Success at last. Just then, my mom walked by looking confused. We updated her. “You should have called me – I have a key for this lock.” I had lived in that very house for 23 years, and not once was I aware of a key. But then again, I think that this was one of the first times that somebody actually needed it. We all laughed hysterically. Black humour really served us well during this difficult time. During the actual Shiva, friends and family dropped in, casserole or coffee cake in tow. Its purpose is to comfort the bereaved in this time of morning. I remember it being a time of great chaos, especially for my mom who was worried about the guests being fed. I remembered my dad, always thinking about my mother’s welfare, saying before his death, “Don’t do it, Rose. It’s too exhausting.” But my mom always had to do what she considered the right thing. We then made a circle and shared a memory of my dad. My memory was that as a little girl, I would stand on my father’s feet and we would dance together. A few days after the Shiva, my husband decided to cut the grass in anticipation of winter. He came barrelling into the house saying, “You are not going to believe what I’m about to say.” Apparently, he had seen a seagull circle the house not once, but three times. In Judaism, it is believed that the soul takes approximately the length of the Shiva to realize that it is no longer attached to the former body. Traditionally, after 7 days of sitting Shiva, the bereaved walk around the house or block three times as a way of telling the soul that it is now free. Well in this case, it was birds. Not that I think that Dad was now “Jonathon Livingston Seagull.” Instead, I saw these bird messages as signs from God that the soul of my dad was now free to move on, and that his time on this earth in that body had come to an end. After that, there were no more messages from birds. Still, every so often when a seagull comes near me, I think of my dad. About a month after my dad died, I wanted to do a private ritual to mark the end of my dad’s life and to purify the room in our house where he had died. My friend and mentor, Barbara Yussack, who has since passed on, helped me plan this ceremony. Eight women came to my house for this purification ceremony. From my mom, I borrowed a tablecloth which had a beautiful labyrinth pattern. On it, we placed an egg to symbolize life. To represent the four elements of Water, Wind, Fire and Earth, we added a glass of water, a blue wavy scarf, a candle, and a plant. I included my dad’s high school yearbook, “ the Torch,” which he had browsed frequently throughout the months prior to his death, his glasses, and a kaleidoscope of pictures representing different times and people in his life. We sat in a circle on the floor in the dining room where my dad had died. As part of the ritual, I symbolically burned a package of hospital gauze which was needed when my dad was in physical form. We each shared stories of our deceased parents who were on the Other Side. Many tears were shed. I talked about my dad and recalled many memories. It made me contemplate how casually we take photographs, never thinking that they will ultimately be used for an obituary or a death ritual. Who knew that this potpourri of random pictures would end up on my dad’s alter. We sang songs about life and death. We cleansed the room, smudging with an eagle feather as in an Aboriginal ceremony. We laughed and we cried. One of my friends mourned not having a dad like mine. It made me realize how lucky I had been. 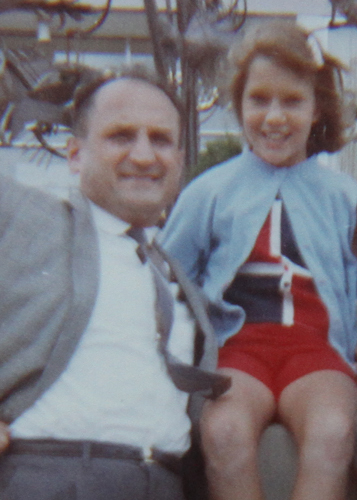 To some extent I had taken Dad for granted – weren’t all fathers like mine? At one point, we all sat in silence and darkness. At the end of the ritual my psychic friend, Mary, quietly shared with me that my dad was there and that she saw him standing in the front landing. I did not have this vision, but I did have many memories of my dad and my mom, slippers in tow, standing in that front landing talking to us, and our children upon their arrival and departure. When Mary told me this, I felt goose bumps running up and down my arms. This ritual for me marked the end of my public display of grief. I discovered that for me the grief was not linear. Instead, it came and went, spiralling in and out of my life. Even after all that I had experienced, it felt surreal that my dad was dead and buried. Even today when I visit the cemetery, I am taken aback to see my dad’s, and now my mom’s, names on plaques. The first six months were the toughest. I was dealing with my own grief, while attempting to support my mother. It was during this time that I found healing in writing, composing poems and recapping the events prior to and after my dad’s death. Little did I know that these heartfelt accounts of my dad’s illness and death, written in Manitoba in 1996 would eventually be published in Thrive In Life, some 14 years later. At that point we lived in Manitoba and had no plans to move to British Columbia. Life is funny like that. I became a member of a club –the club whose members have experienced the death of a loved one. Nobody really wants to join the club. It just happens. An interesting dynamic happens in that club. 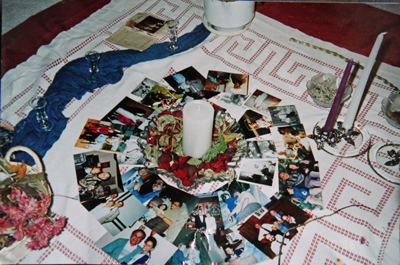 People open up and share their experiences and acute sense of loss. I found myself having deep conversations with mere acquaintances. One day I opened up to my daughter’s teacher who had lost her father. “When I see somebody of my dad’s stature wearing a hat like his, part of me thinks it is him,” I explained. “I know exactly what you mean,” she retorted. Our similar experiences were not surprising for after all we did belong to the same club. Yet there is something very beautiful about sharing our sadness with club members. It is during these exchanges that these superficial relationships are elevated to a spiritual plane. Diane,there is passion, compassion, humour and style in your latest story…all the elements in Maya Angelou’s definition of thriving.